LEGION OF THE UNLIVING "IV"
History: (Avengers I#353-354) - As part of a plan to kill the Avengers for supposedly killing him, the Grim Reaper downed an aircraft and captured many of the survivors. Luring the Avengers to a Hell-like realm, the Reaper pitted them against the dead crash victims, controlling the dead through power granted him by Lliogoroth. He also performed a rite that created fascimiles of a number of dead Avengers foes from the bodies of the crash victims, and sent this zombie-like Legion of the Unliving to kill the Avengers. The Avengers did quite poorly against the creatures. Hercules, newly mortal and with his power greatly lessened, was overpowered by the Star-Stalker and Count Nefaria. The Vision discovered that Amenhotep and Necrodamus were mystical enough to touch him even in his intangible state, but that their supernatural natures made them somewhat vulnerable to his solar beams. Sersi found her molecular-restructuring abilities useless against Nebulon, a shape-changer; worse, the Celestial Man's power to tap biospheric energies allowed him to absorb her energy blasts. Crystal's elemental powers did nothing to Inferno's fiery body. Finally, the Black Knight was horrified by the undead nature of the Red Guardian, Zemo, and his uncle Nathan Garrett, especially after they attempted to feed on his blood. The Vision, deciding that stalemate against Necrodamus and Amenhotep did nothing, instead used his intangibility to travel to the Reaper. The Vision forced the Reaper to realize that he had not been killed by the Avengers, but had committed suicide. Realizing this, the Reaper lost control of the Legion's souls, and the dead villains stalked back towards him for vengeance. Before they could harm the Reaper, though, Lloigoroth burst through the wall of the Reaper's castle and apparently consumed him. The Legion members then went back to their eternal rest. Comments: Legion of the Unliving idea created by Steve Englehart and Roy Thomas; idea, nature, and roster for this version designed by Len Kaminski and M.C. Wyman. It's par for the course in these Legion of the Unliving tales to note how many of the members returned to life. Count Nefaria was revealed to have never been dead in Iron Man 1999. Maybe his ionic coma was close enough for the Reaper to use him anyway? The Red Guardian was brought back (it was revealed that he never actually died) for no good reason in the continuity trashing early 21st century, @ Daredevil II#64 (maybe he's an LMD)? It should also be noted that Necrodamus was never really killed anywhere. 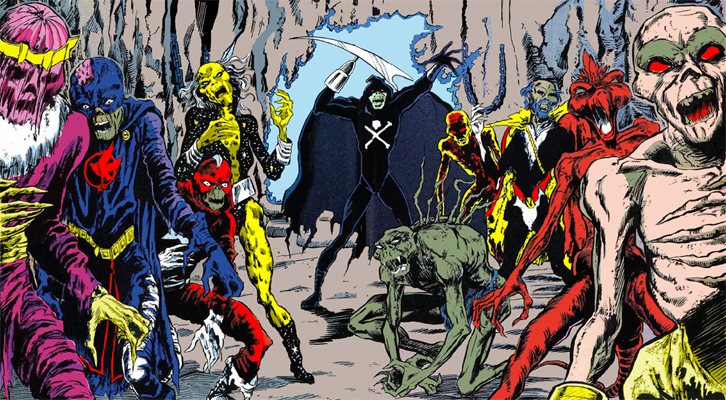 "Robert McKinney notes that Necrodamus did indeed physically die in Marvel Team-Up I#130, allowing his spirit to dissipate. He came back just as voluntarily in Fantastic Four I#334, where he was again banished to Limbo. I'm guessing Kaminski got the MTU appearance, but overlooked the FF stuff when he was researching the issues." see Legion of the Unliving I for comments on Baron Zemo. This storyline features homages to the Evil Dead and Return of the Living Dead films, as pointed out by a later letters page. In the second part, the slaves of the Grim Reaper scream "Eat Your Brains" and "Swallow your souls". A decapitated head bites Dane Whitman's hand pace Evil Dead II. Avengers I#353 advertised on the last panel that the next issue would be titled "Dead By Dawn", the subtitle for the second Evil Dead film. However, Avengers I#354's story was titled The Conqueror Worm, a name from an Edgar Allan Poe work. All Legions of the Unliving got a group entry in OHotMU Horror 2005 & OHotMU A-Z HC#6. It was an immensely powerful supernatural entity in the form of a hand with a mouth on its palm and eyes at its fingertips. Lloigoroth was created by Len Kaminski and M.C. Wyman. Lloigoroth resembles a creature in a Lovecraftian tale by Colin Wilson, "The Return of the Lloigor." In that tale, the Lloigor is apparently an agent of the Old Ones (Lovecraft's unspeakable ancient creatures) and appaears as a normal man with mouths on his palms. As Marvel's Elder Gods (Set, Gaea, Chthon et. al.) and the N'Garai are meant to resemble Lovecraftian deities, we can probably figure Lloigoroth is related to one of those groups. Azotharoth aka Azathoth, the Demon Sultan, the roiling nuclear horror that dwells at the heart universe attended by formless idiot flute players. Mentioned often but never really appearing and only one unfinished fragment of Lovecraft's bears the title "Azathoth". Nigguraab aka Shub Niggurath the Black Goat of the Woods With A Thousand Young. Mentioned in several stories most particularly "The Whisperer In Darkness". Seen as some sort of Dark Mother breeding monsters and uncleanliness. Some of the comments about "Lloigoroth" are mixed up. The name Lloigor was invented by August Derleth, who published the "Cthulhu Mythos" stories by H.P. Lovecraft and others after Lovecraft died, as well as writing many of them himself. Derleth's Lloigor was a giant tentacled creature but, when Colin Wilson contributed his story "Return of the Lloigor" to Derleth's collection Tales of the Cthulhu Mythos in 1969, he used the name instead to describe a race of invisible and intangible beings who telepathically influenced humanity. A completely different story in that collection, Ramsey Campbell's "Cold Print", featured a demonic entity (named Y'Golonac) who had no face but had hungry mouths in the palms of its hands. This was probably the visual inspiration for Marvel's Lloigoroth. (And Chris Claremont probably derived the name "Y'Garon" from Y'Golonac for one of his Elder Gods.) Confused enough yet? In Dr. Strange III#48 Umar references the "Great Abyss of Lloigoroth". The story was written by Kaminski as well.